The modern incarnation of the Wooden Chicken began in 1863 in the mountains of Bavaria. A disfigured hermit named Lars Haasenfaust started up a small anarchist movement. Posing as wood carvers, Lars and his "apprentices" from the compound distributed hollow wøøten chikens to farmers with secret messages inside. After being noticed by German authorities, Lars and his apprentices fled the country under the guise of a fishing boat crew. The Farmers supplied the artist revolutionaries with a rowboat, and they set out for the United States, quite possibly the only country weird enough for them not to be noticed. Sadly, Lars and co. were unprepared for the long ocean voyage via rowboat and were forced to make an emergency stop in Norway. Keep in mind that Norway in the 19th century was in the throes of a bloody troll insurrection. Eager to help the Norwegian volunteer army, the artists of the Wooden Chicken entertained the soldiers with musical productions and interpretive dance. They were so impressed with the tenacity of the norwegian troops that they vowed to chronicle the troll menace in wood once they got to the United States. Newly energized, Lars set off once more for the 'States. 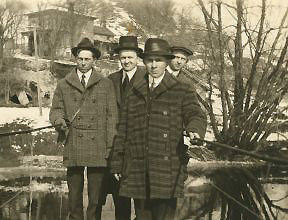 Arriving in 1902, Lars set up shop in the small town of Mount Horeb, Wisconsin, where he was soon exiled by the Mayor for public drunkenness and other vague brushes with the law. Living on the city limits, Lars would carve his trolls and have his subordinates plant them in town to mystify the citizens. These masterfully carved trolls still stand there today. Lars has not moved back to town since.